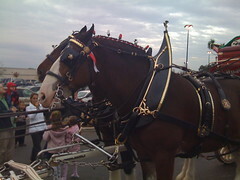 I was driving by the Spotsylvania Towne Centre this afternoon when I spotted three Budweiser trucks in the parking lot. That could only mean one thing, the Budweiser Clydesdales were making an appearance. I remember visiting Grant's Farm in St. Louis as a child and seeing these majestic animals. Even today I am still impressed at the sight. And judging by the crowd that had gathered, I am not the only one. Ah, the goats. I forgot about the goats. It must have been humorous for parents to give their kids a cone of feed and then stand back and watch the marauding goats attack. This is exactly what we do with our kid :D I quite like feeding the goats and deer myself actually! The Last Event at Old Dominion?